Imelda Remedios Visitacion Romualdez (Imelda Trinidad Remedios Romualdez) was born on July 2nd, 1929 to Vicente Orestes Romualdez and Remedios Trinidad in Manila, Philippines. Vicente was a lawyer and former dean of St. Paul's College and Remedios was a dressmaker and homemaker. When Imelda was around nine years old, she lost her mother to pneumonia (1938). Around the same time, her father's law practice started to slow down and he couldn't provide for the family. Every once and a while, Imelda would sell a small diamond off her mother's necklace whenever money was tight. Moving to family province Leyte, Imelda and her family found some recovery but still were financially struggling. Imelda was the oldest child of Vicente and Remedios. She had five younger siblings and several other half-siblings from her father's other marriages. Attending Holy Infant Academy, a Catholic girls school in Tacloban, she was raised Catholic. 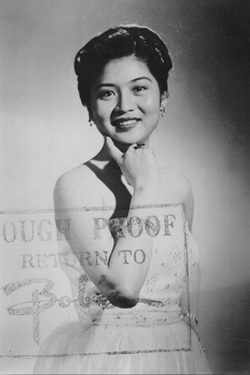 As a teenager, Imelda was voted the most beautiful girl in her province Leyte. When she was 18 years old she was crowned the title of "Rose of Talcoban" and "Miss Leyte". She went on to become the special title of "Muse of Manila after the Miss Manila beauty pageant in 1953. In 1954, Imelda met Ferdinand E. Marcos, a young politician. At the time, Ferdinand was a Congressman for llocos Norte. Half and hour after Imelda met Ferdinand, he proposed and asked her to marry him. After eleven days, Imelda married Ferdinand in a small civil ceremony . A month later, Ferdinand and Imelda Marcos threw an elaborate bash for friends and family celebrating their marriage. 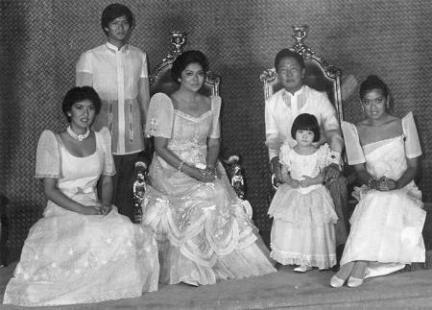 Together, Ferdinand and Imelda Marcos had three children: Maria Imelda Marcos "Imee", Ferdinand Marcos Jr. "BongBong", and Irene Marcos. Their fourth child, Aimee Marcos, was adopted.